This is a typewritten article written by the Timmins Committee, Communist Party of Canada. It is entitled, True Fifth Columnists. Three pages. It begins with a bold statement: "The infamous Defence of Canada Regulations (which the Timmins Press so ardently supports) provide for the arrest of anyone "sympathetic" to an outlawed organization. Neither Bill Wren, Joe Bradette nor Roy Thompson have been shy in bestowing their sympathies upon fascist organization in general, and a foremost fascist, Leo Mascioli, in particular. WHY DOESN'T THE GOVERNMENT ACT TO ARREST AND TRY THESE SYMPATHIC GENTRY?" It further states that Leo Mascioli was connected with the local fascists and was involved in a plot to sabotage the mines. The Party insists that they believe that "such rats are truly guilty of these charges" but that there should be an open trial, so as to properly expose others also guilty. The Party believes that the Timmins Press, owned by Leo Mascioli, is the "mouthpiece of such true fifth columnists." The final line on page 1 reads: "ARREST BILL WREN, ROY THOMPSON, JOE BRADETTE and their accomplices AT ONCE!" 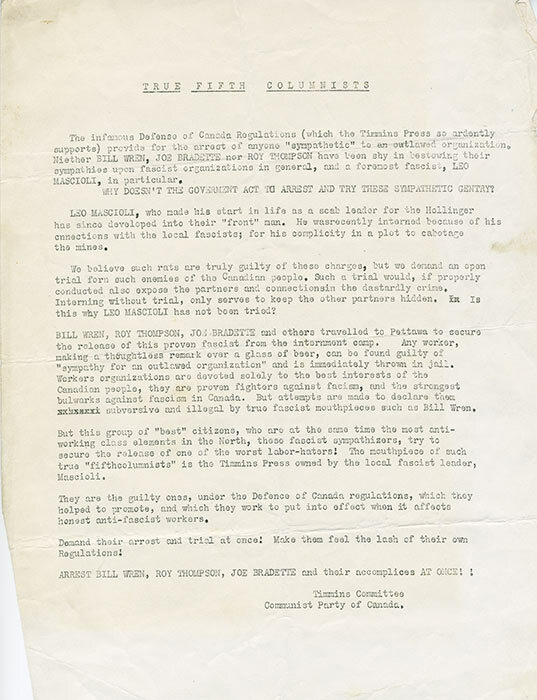 Page two outlines the Party's criticism of the Canadian government in its decision to enforce Conscription. "We are being asked to trust a government which ably assisted the betrayal of ponco at Munich in violation of d 1 pledges -- which later, led Canada into the imperialist war -- which has throttled all democratic rights!" In page three, the Communist Party vows to continue fighting for the working class. "It will lead the working class of Canada out of the horrors of capitalist war, out of exploitation!" It calls to the workers, the farmers, middle class and professional people, and all people to unite.